US Walk In Tubs | Made In U.S.A.
U.S. Walk In Tubs For Home Or Business. Made In U.S.A.
Do you want a walk in tub that’s made in the U.S.A? Aging Safely offers several top domestically manufactured walk in tub models for your home or business. U.S. made walk in tubs are some of the best step in baths you can find. We understand how important it is to support local companies that manufacture elderly bathing products here at home. We’ve selected the absolute highest quality brands that are a great option for new construction, retrofit residential or commercial applications. 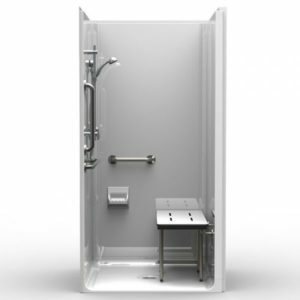 Several of our units are ADA compliant showers and offer a variety of safety features to help add peace of mind to your bathing experience. Aging Safely Proudly represents Best Bath Systems hydrotherapy walk in tubs and wheelchair accessible handicap showers. They are skillfully manufactured in Boise Idaho and come with industry leading warranties and features. Our Made In The U.S.A. walk in tubs have the options you want! Heated seats, warm air hydrotherapy, whirlpool jets, hydro feet massage, chromotherapy mood lighting, aromatherapy, luxurious roman faucet, handheld shower wand and an ozone sterilization system. Whether you want the simplicity and convenience of Aging Safely’s full service installation service, or would rather take care of the install yourself, you have the best options at our Everyday Low Pricing. Our walk in tub installers are fully licensed and insured. You can be assured all manufacturers guidelines are followed when we handle the full installation process. Our installations come backed with a complete industry leading manufacturer warranty and have full labor warranties for added peace of mind. If you prefer to handle all the details, you can get your new walk in bath tub or handicapped shower drop shipped right to your door. While this option can help save money, it also is important the installation is performed by a licensed, insured plumbing contractor that can follow manufacturer’s installation guidelines precisely. A proper installation is essential to ensure keeping the full manufacturer warranty of the system and to help make sure your new walk in tub or wheelchair accessible shower will last a long time and perform up to its standards. Why You Would Want To Buy A Walk In Tub Made in The U.S.A.
Purchasing domestic made goods feels good! Aging Safely is an American owned business and we believe it’s very important to support local businesses. While we also think it’s important to partner with some companies internationally, we still have a sense of pride when it comes to our home. Buying domestically made walk in tubs can help keep your money investing in America’s businesses. Keep America working! The U.S. has many talented, innovative and hardworking people that you can count on! We build your handicap bathtub with a great sense of pride and honor. Each walk in bath is skillfully manufactured and then fully tested before it ever leaves the factory.